Questa is an older Hispanic settlement in a beautiful valley where the mountains give way to the southern end of the San Luis Valley. The road east is the Enchanted Circle Scenic Byway and heads up the hill to Red River and then Eagle Nest. The road north goes past the Wild River Scenic Byway on its way to Costilla and then San Luis and Fort Garland in Colorado. 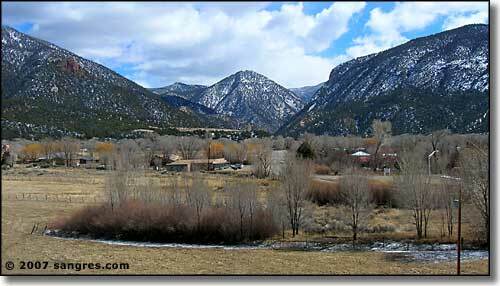 South, the road passes Lama, San Cristobal and Arroyo Hondo before coming into Taos. Originally named San Antonio del Rio Colorado, Questa had its name changed by a US postmaster (who mispelled the name at the same time - it should have been "Cuesta," meaning "slope" or "ridge"). The first Spanish visitor in the area was probably Francisco Vasquez de Coronado, following the Kiowa Trail (a trading/raiding trail that connected the Pueblo tribes to the south with the Ute, Comanche and Kiowa tribes to the north). In 1592 or 1593, Francisco Borilla and Juan Humana came through here before crossing the Sangre de Cristo's to the Purgatoire River drainage where they found gold. It was on their way back from the venture that they were attacked and killed, leading to the naming of that river: Rio de Las Animas Perdido en Purgatorio. There was other mining in the area, too, that probably continued with Indian slave labor up until the Pueblo Revolt of 1680 when the Spanish were cast out of New Mexico. As the Questa area was used as a staging area for raids on the Spanish settlements to the south by the Utes and Taos Indians, Spanish re-occupation of the area took many years. A settlement wasn't established in the area of Questa until about 1820, and even then there was still major conflict with the local Indian tribes. For that matter, almost from the beginnings of settlement, Questa itself was of mixed blood (Hispanic Jewish and Hispanic, French and French-Canadian Catholic). The area has an almost 200-year-old reputation for contentiousness and for requiring extra effort on the part of police organizations. 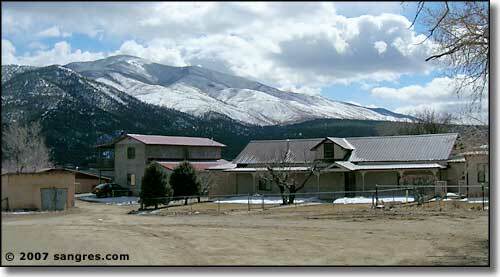 1916 saw the founding of the R & S Molybdenum Mine (now Molycorp). There have been many changes in ownership of the mine over the years but it still remains as Questa's main source of employment. The traditional sheep herds have been mostly replaced by cattle herds, while the raising of alfalfa, hay and winter wheat has dropped off. Local folks who can't get jobs at Molycorp end up commuting to Red River, Taos and Angel Fire. 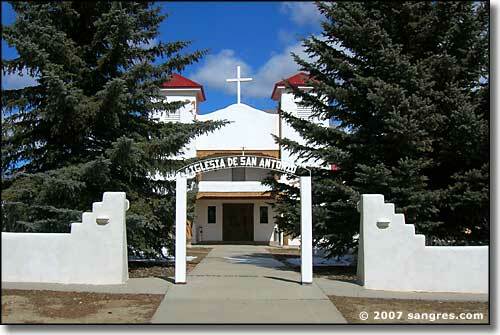 As beautiful as the area of Questa is, it is one of the least tourism-oriented towns in northern New Mexico.